JOHANNESBURG (AP) Nelson Mandela reminisced with fellow anti-apartheid activists and met with top football officials Thursday, one month ahead of South Africa's upcoming World Cup, which he helped bring to Africa for the first time. The 91-year-old former president, who retired from public life in 2004, met with FIFA secretary-general Jerome Valcke and chief local organizer Danny Jordaan, who brought the 18-carat, solid gold World Cup trophy to the Nelson Mandela Foundation building in Johannesburg. The meeting was held in private, with no journalists present, though FIFA later released photographs. He also met privately Thursday with fellow anti-apartheid activist Denis Goldberg and Namibian independence campaigner Andimba Toivo ja Toivo, his foundation said. Goldberg was sentenced to life in prison along with Mandela at the Rivonia trial in 1964, and Toivo ja Toivo served time alongside Mandela at the Robben Island prison off Cape Town. Goldberg brought Mandela a copy of his autobiography, which was released recently. 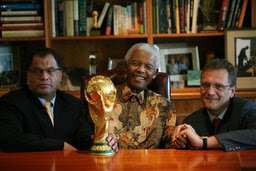 ``For us there was no way that the trophy would arrive in the country and not be brought first to Mandela,'' Valcke said. It is still uncertain if South Africa's most famous citizen will appear at the World Cup's opening ceremony at the Soccer City stadium on June 11, although FIFA president Sepp Blatter has said he hopes Mandela will. Mandela has strong links to sport in South Africa after he famously appeared at the 1995 rugby World Cup final wearing the green and gold jersey of the Springboks, the country's national rugby team. The jersey had previously been associated with the racist apartheid regime, and rugby was considered the sport of white South Africans.